Patrick Mahomes‘ hot start continued with three TD passes against the 49ers, extending his record-breaking start to the season. His first touchdown was a laser to the back corner of the endzone after a scramble. The 49ers had more success getting pressure on and containing Mahomes in the second half, but the damage had already been done. Tackle Mitchell Schwartz put together his best showing of the season with a dominant, well-rounded performance. He took care of business in pass protection, gifting nothing to a 49ers’ pass rush. When the Chiefs needed to get gains on the ground, they sent a number of runs his way, particularly on that final drive with seven runs ending up on his side of the line. Edge defender Justin Houston turned in his usual dazzling display as a pass rusher in spite of dropping into coverage on nearly 25 percent of his pass snaps. He proved hard to handle for 49ers tackle Mike McGlinchey, as Houston capped off a multi-pressure day with a strip sack. While the Chiefs’ coverage unit remains a work in progress, their pass rush picked up some of the slack. Along with Houston, Allen Bailey and Dee Ford each turned in multi-pressure performances with Ford’s performance all the more impressive having earned those against 49ers’ left tackle Joe Staley. Tight end George Kittle‘s blend of physicality and athleticism led him to break multiple tackles against the Chiefs. His style and production will quickly make him a hit with the fans and a nightmare for opposing defenses. The 49ers slowed the pace in the second half to edge their way back into the game and they did it by chipping away at the Chiefs’ run defense with Alfred Morris carrying the bulk of the load. Morris was solid on zone plays with decisive reads and cuts to find the right lane and put himself at an advantage going into contact against opposing defenders. With Jimmy Garropolo‘s availability in doubt after he exited the game with an injury, the 49ers ground game is going to have to carry a heavy burden in the weeks ahead. Injuries exposed the 49ers’ depth at cornerback with six corners seeing the field over the course of the game. Veteran Richard Sherman got off to a strong start including a deep pass breakup against Tyreek Hill before he was forced to leave the game. Ahkello Witherspoon surrendered a key pass interference penalty on the final drive and D.J. Reed was beaten deep on a play with an inaccurate Mahomes pass bailing him out of allowing a long touchdown pass. Linebacker Reuben Foster‘s return to the field produced an active performance with mixed results. He recorded some pressures and stops while displaying some instances of good coverage, however, he was also guilty of a slew of missed tackles in both the run and pass game. Kansas City: The Chiefs offense as a whole was simply too strong for the 49ers. Though the 49ers clawed back in the second half, the Chiefs exploited weaknesses in coverage on the first five drives and Kansas City’s offensive line put on a dominant display on the five-minute drive to close out the game. San Francisco: Injuries were a factor in this one. 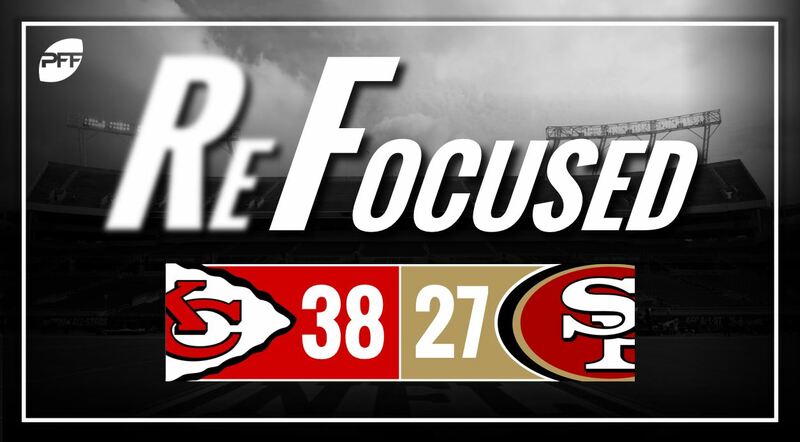 The 49ers secondary struggled with the Chiefs high-powered offense.